Broad beans can still be sown until mid November, best sown in pots and planted out when 10cm tall. Now is a good time to clear the garden or allotment before the really wintery weather sets in. Remove yellowing cabbage or Brussels sprouts leaves and any plant debris to prevent homes for over-wintering pests and diseases. On empty ground you can mulch with some well rotted manure and leave for the worms to work their magic. 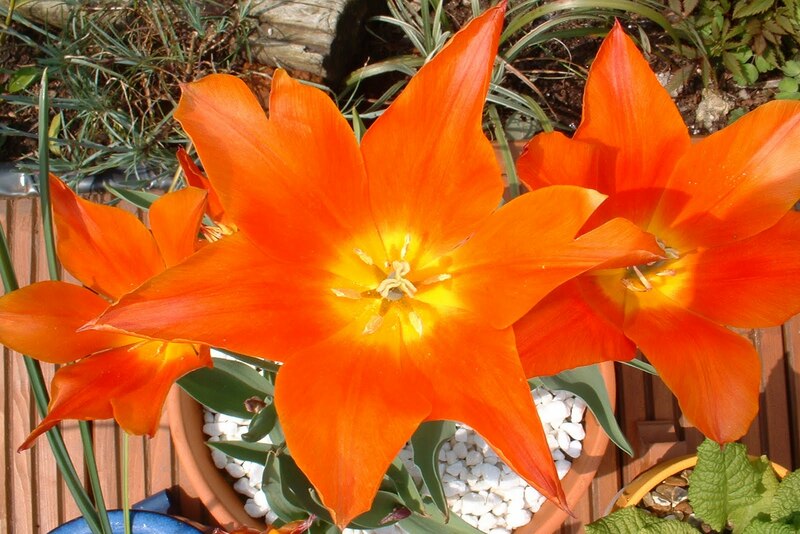 Pot up bulbs for Christmas presents or just to enjoy in the garden. If you have the bulbs given out by Julie at the November meeting, they should be planted by the 8th November according to the instructions. If you have tulip bulbs they should have been planted out by now. Prune your roses to prevent wind-rock. Cover brassicas with netting if you have a pigeon problem. Insulate your greenhouse with bubbles wrap to protect the plants inside from frost. If you have fruits trees, stop winter moth damage by putting grease bands round the trunks. Plant bush, cane and tree fruit while the ground is still soft. Plant garlic and onions. Don’t forget to feed the wild birds and keep plenty of water available for them for washing and drinking remembering to check it has not frozen over. Cut of this summer’s fruiting blackberry and raspberry canes at ground level and tie in new canes. Order new fruit bushes for winter planting. Lift potatoes on a dry day and prepare for storing. Clear any fallen leaves from ponds and pathways. Sow Swiss Chard, spinach and mixed winter salad leaves directly in to the ground. Draw the soil round leeks and celeriac. Look around your garden and see what you can enter in the Summer Show. Weed your garden thoroughly while dry. Remember the saying ‘one years seeds - seven years weeds! Keep greenhouses well ventilated and wet the floors for extra humidity and to lower the temperature. Pick beans and courgettes regularly and let us know of any recipe ideas for courgettes. Dry onions on the surface of the bed or indoors in the dry before stringing up. Sow winter vegetables in seed beds or pots for transplanting later. Pinch out the tips of tomato plants when 4 - 5 trusses have set. modules to transplant under cover, mainly for winter. The Hampton Court Flower Show is on from July 6th to July 11th - try to get there if you can otherwise watch it on TV. Start thinking what you can enter in our Summer Flower show! Take cuttings of shrubs and alpines. Stake sunflower & autumn perennials, remove blanket weed from ponds. Trim box topiary to keep in shape. Pinch out broad bean tops. Keep up hoeing, weeding & mulching. Side shoot, stake and tie in tomatoes. Keep an eye open for pests. Keep up the direct sowing of vegetables and thin earlier ones. Plant colchicum, cyclamen & nerines. Stake tall perennials if necessary. Mulch strawberries. Greenhouse glass should have some shading to prevent plant scorching. Feed & deadhead roses after first flush of flowers. Sow seed of biennials such as Canterbury Bells and Sweet Williams. Net soft fruit and cherries to protect from birds. Harden off seedlings under cloches. Protect seed beds against birds. Watch out for insect pests and take protective measures. Continue weeding. Earth up early potatoes protect soil if frost threatens. Support peas and start side shooting tomatoes. Keep lawn edges cut as this makes garden look tidy even if there's no time to mow the grass. Sow under cover: broccoli, cauliflower, courgettes, cucumbers, kale, marrows and sweet corn. Sow in open: broad, French & runner beans, beetroot, broccoli, cabbage, carrots, fennel, lettuce, peas, radish, spinach, swedes, pumpkins, squash and turnips.Divide primulas & polyanthus after flowering. Check lilies for lily beetle larvae and treat with Provado. Plant up baskets, pots and containers. Move or divide spring flowering bulbs. Water & ventilation are vital for greenhouses. Tie in raspberry & blackberry canes to avoid wind damage to new canes. Plant herb seed in pots. Regular spraying of roses is essential - try to do this every 14 days. It's not too late to sow a few more parsnips. Beans, courgettes, squash, pumpkins and sweetcorn can be sown behind glass to plant out at the end of May. Hardy annual flowers can be sown directly into the soil. Repeat sow salad leaves, lettuce, herbs, carrots and spring onions directly into the ground. Finish planting chitted potatoes. Clear beds of winter vegetables and prepare the ground if not already done. Cover brassica and carrots with mesh or netting to deter flying insects or pigeons. Give a liquid feed to autumn sown garlic. Dahlias can provide cuttings from surplus shoots. Keep an eye out for slugs and snails - try placing fruit skins nearby for them to hide in, but remember to dispose of each morning. Hanging baskets can be potted up, but left in the greenhouse until the frosts have passed. Continue to sow seeds of vegetable and flowers remembering to sow a few extra for our plant sale please! Indoor sowing of herbs can be started in pots or trays, such as borage, coriander, marjoram, sorrel and lemon verbena - cover the seeds with some vermiculite. Deadhead daffodils as they fade. Delphiniums will provide cuttings, take 3-inch cuttings from below the soil and insert into gritty compost. Any further pruning required for roses should be completed this month. Herbaceous and perennial plants can be split and potted up ready for the plant sale in May! Hoe weeds regularly before they get too large and be vigilant for slugs and snails now that plants are coming into growth. Potatoes can be planted as soon as the ground is suitable. Remember you can warm the soil by using a cloche or some plastic so you can get your seedlings out slightly earlier. Rhubarb can be covered with a pot to force early stalks. Sow beetroot, peppers, chillies, broad beans, spinach, summer cabbage, calabrese and lettuce in trays or pots. Onion sets, shallots and garlic can be sown outside when the ground is workable. Crop parsnips, leeks, cabbages, kale and swiss chard. Parsnips can be sown now if it's warm enough as they need a long growing season. The parsnip seed can be germinated on slightly dampened paper towel, then you'll know if the seed is viable before you put them in the soil. Apply a general fertiliser to the ground. Cut back cane and fruit bushes. Autumn fruiting raspberry canes can be cut to ground level and mulched. Lime can be added to brassica beds. Potatoes can be put in egg boxes to chit. Snow drops can be divided whilst green. Remember to get your lawnmower serviced ready for the new season. Protect any blossom on fruit trees from frost. Spray against peach leaf curl. Clean and disinfect the greenhouse if not already done and remove any dead leaves from plants to prevent disease.